Growing and managing a business is about maintaining good relationships with your customers before, during and after their interaction with your company. Granted, in many cases that interaction will take place primarily over the phone, so if you have to record additional information then you will likely benefit from additional assistance through a customer relationship manager (CRM), such as Salesforce. The question is how can this CRM improve your business’s phone system and how it can seamlessly integrate into it. Aside from being entirely cloud-based, Salesforce is a huge asset in a company’s CRM system because it is not just a single product but a complete integrated solution that comprises of seven different parts for $75 per month per user (the number of which can be unlimited). These different parts of Salesforce are as follows: Community Cloud, Marketing Cloud, App Cloud, IOT Cloud, Sales Cloud, Analytics Cloud and Service Cloud. The primary part of Salesforce is Sales Cloud, the CRM and sales force automation solution, but the addition of Analytics Cloud allows for an improved, analytical approach to how your business is running. Meanwhile, the Community Cloud is for directly connecting customers, partners and co-workers to the required information. Marketing Cloud is used to create different campaigns. App Cloud allows you to manage and control all the apps available to your employees. IOT Cloud imports data from every device using Salesforce for further analysis. Lastly is the Service Cloud, which is the main customer service app. That last one is the most important, since it encompasses everything you might need to interact with your phone system, such as the call tracker. The only downside to this solution is that all calls have to be logged manually, but despite that you can record various data into the activity section, whether that is the caller’s name, the subject of the call and any additional detail. Afterwards you can create follow-up tasks to be assigned to either yourself or any of your co-workers. As already mentioned, Salesforce is unable to track calls on its own and therefore you will need a complementary solution to fill in the gaps between this solution and your cloud phone system. Grasshopper, for instance, has its own call tracker within the system, but since the company doesn’t support direct integration with any other third-party software, you will either have to resort to the manual tracking already discussed or choose another program. The best solution is to switch around the way the integration is handled, instead implementing the phone system into Salesforce rather than the opposite way around. This can be done via the use of CTIs (computer-telephony integrations), which are also known as softphones. 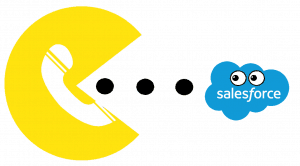 And as it happens, the leader in this option is RingCentral for Salesforce, available for subscribers of RingCentral Office Premium or Enterprise. This is a softphone that becomes part of your Salesforce account, allowing you to initiate calls with one click or even direct calls to your desk or mobile phone. All incoming calls are identified by Salesforce where they are duly logged into your account, – with or without the notes you have added about the call – for reporting purposes.